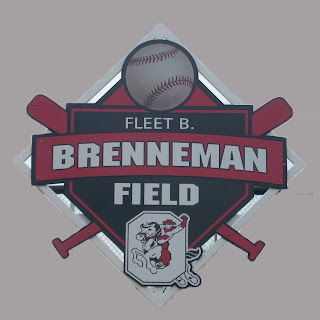 Had a chance to meet up with Red Rider baseball coach Scott Marshall a few weeks ago and get my first up-close look at the improvements made to the now renamed Fleet B. Brenneman Field. I was really impressed with the practically new facility and equally as impressed with how bright the future looks for the Red Rider baseball program. It started last fall, when word of a sizeable donation to the baseball program began to make it's way through the community. I'm told the initial plan was to establish a field on the grounds of the new Orrville Middle School, but the gift (while plenty big) was not big enough to create a field from start to finish. Plan B was to approach the city and offer the money to improve the existing field at the corner of Carnegie & Ontario High and Hall St.
Work started immediately, with the demolition of the old dugouts and excavation of the infield. Local contractors began work on the new dugouts and storage barn, and the AG Design Company out of Seville handled the construction of the new infield. They have worked on numerous infield projects all over the country, including the infield at Canal Park in Akron. As Spring broke, the final touches were put on the field (paint, fence tarps, etc), and the first games have already been played. New field-level dugouts on both the home & visitor side. A field maintenance storage building attached to home dugout. New fencing along foul territory. New fully enclosed 2-bay batting cage (with field turf surface). New fully enclosed bullpen behind home dugout. A more premanent outfield fence. Installation of a new grass infield. Here is an up-close look at the new fence anchors. This will allow the fence to be used during games, and then removed for the 4th of July festivities, and then re-installed with minimal effort. It certainly is an upgrade over the snow fence and puzzle piece PVC fencing that has been used in the past. The new fence along with the fence tarps down each foul line gives the field some separation from the rest of Orr Park, and the feel of an actual facility instead of just an open field. And now that yours truly has set foot on the hallowed grounds, good things are sure to follow. With these improvements now complete, the district has seen major athletic facility upgrades over the past 2 years. Included in this was the upgrade of football stadium (new bleachers), gym (new floor & bleachers), softball field (new bleachers) and baseball field (renovation). A total of seven of the school's varsity sports (football, boys & girls basketball, volleyball, wrestling, softball and baseball) will have been positively impacted due to these upgrades. Total costs for all of these projects weighed in at around $1 million, comprised of city funds, private donations, grants and fundraising. Quite an accomplishment in this economy. The field will be officially dedicated on May 1st, and a full schedule of events will mark the occasion. Here is the schedule as provided to me by Coach Marshall. The alumni softball game is for any OHS alum who was part of the baseball program. This is an opportunity for alumni to see the new field as well as reconnect with old classmates and to sort of bridge the past and present. Coach Marshall has provided me with a list of former players that have an open invitation to play in the alumni game. Here it is (some real familiar names on that list). If you are on the list and would like to play in the game, please contact Coach Marshall here. If you know someone on the list and think they might be interested in playing, feel free to forward them the link to this post. When I spoke to Coach Marshall a few weeks ago, he mentioned that total numbers for the JV and Varsity teams combined are in the low 20's. According to Coach Marshall, they will start several freshmen and sophomores to boot, adding the unknown of youth to the lack of depth. But so far, so good, the Riders beat West Holmes twice in the early season and did it with pitching and defense. Here is their schedule for the rest of the season. I've also heard great things about the numbers in our youth programs, giving me reason to believe that the baseball program will benefit greatly in the coming years. I love how the kids are given the opportunity to play on the "big fields" a few times a year. Gives the kids (and parents) something to get excited about. Coach Marshall deserves a lot of the credit for this. I'm sure he'd be the first to deflect it, but running the high school team and the youth league takes a lot of time, organization, dedication and sacrifice. It's easy to see that Coach lives and breathes baseball, and is the first to pick up a rake and rake the infield, or stripe the foul lines. The day I was at the field, the entire team was there helping maintain their new facility. Whether it was mandatory or not is not the point, the team sees the field as a gift (which it is) and in caring for the field, they show their dedication to the program and their community. Let's be real honest....baseball is a 3rd place sport in Orrville behind basketball and football, that may never change. Some may even say a 4th place sport behind track (that's debateable, I'd say both are a distant 3rd to football and basketball). You can't change perceptions overnight, but I think Coach Marshall is going at it the right way by building a youth program and infusing some excitement into the town. And as we all know, success has a funny way of increasing participation and interest. About the picture on the right....that's former head coach Jim Swaney. He coached the Red Rider baseball team during the 70's and 80's, including a state runner-up finish in 1976 and several regional runs. He continues to be a successful coach, currently leading the Winamac (Indiana) Warriors girls basketball team. He's the 10th winningest active coach in all of Indiana girls basketball, and has amassed over 400 career wins as a coach (that's Smitty territory). 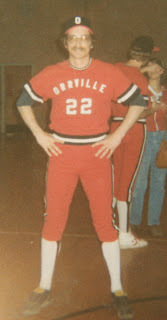 He was the architect of many (and some of the last) great Orrville teams. Loved how the baseball pants in the 80's mimicked the football pants in terms of striping. Good luck to Coach Marshall and the Red Rider Baseball team in what feels like the start of a new era of Orrville baseball.